Versatile industrial premises of 209.3 sq m (2,252 sq ft) approx. Popular and accessible location close to Immingham Dock and benefitting from good road access to the A180/M180. From 1st November 2016, 24 x 7 Lincs Ltd, will utilise Davian Business Centre's Office facilities. The Company has been in the motor transport business for many years but since 2003 has specialised in special needs passenger transport. The Directors of the company have used their many years of passenger transport experience to design and set up possibly the best and most effective special needs transport organisation in the country. The company operates under a Public service vehicle operator's licence issued by VOSA and a Private Hire Operators licence issued by Uttlesford District Council and owns and operates a fleet of modern vehicles that are dedicated to school and social care transport. Vehicles are ordered and purchased specifically to the clients requirements. The average age of the vehicle fleet is less than 3 years. Currently our fleet exceeds 800 vehicles, consisting of cars, people carriers and wheelchair accessible vehicles and we employ in excess of 1000 drivers and passenger assistants. All of our vehicles are to Euro 4 specification as a minimum ensuring a low carbon footprint within the community. From November 2016, 24 x 7 Lincs Ltd, will utilise Davian Business Centre's Warehouse and Office facilities. API Studbolts Limited are Suppliers of high integrity, manufactured studbolts and special fasteners. They are manufacturing and distributing studbolts & special bolting, to the oil, gas, petrochemical, power, nuclear and associated industries. They can do various grades from standard B7,L7, B8M & B16 to 660, 254SMO, Inconel, Duplex, Super Duplex and Durehete. They can virtually do any grade of material. They stock coated product also, mainly Zinc, HDG and PTFE. They have facilities located in Stallingborough, North East Lincs, so can always be on hand whether your requirement is shutdown/urgent, or project based. API are part of a group of companies, that specialise in the supply of gaskets, hoses, seals, pipe, flanges, fittings & valves, so they can competitively offer the complete mechanical range. From November 2015, T-Mec Productions Ltd, will utilise Davian Business Centre's Warehouse facilities. T-Mec Productions Ltd offer a full and comprehensive production solution. Whether it be staging and rigging, audio, lighting, site and event management or all of the above, we are rapidly becoming one of the market leaders. We are able to offer bespoke solutions to accommodate your every need. Have a look through the site, get in touch and see your vision come to life! Please see their website at www.stageandlight.co.uk or contact 01469 576002 for more information. From July 2014, Clarkson Port Services Ltd, will utilise Davian Business Centre's Offices and Warehouse facilities. Clarkson Port Services Ltd bring together companies with cargo to ship (charterers) and those with vessels capable of shipping it (owners). In short, their expertise helps make the transaction happen. Their clients move dry cargoes (iron ore, coal, grains etc) and wet cargoes (crude and refined oil and oil products), raw materials and finished products, gases and oils, chemicals and molasses. They transact business in every size of ship - from small units to those so large that they could not only swallow several football pitches, but complete stadia as well. These vessels criss-cross the oceans on the world's great arteries of trade, with every nautical mile managed and overseen by their team of more than 1000 professionals in 37 offices worldwide. Please see their website at www.clarksons.com or contact 01469 574649 for more information. From May 2014, Northern Exchange Services, will utilise Davian Business Centre's Offices and facilities. Northern Exchange Services are a long established Bureau De Change in the local area. Please contact 01469 571757 for more information on their company. We now have several warehouse/industrial units and a brick store to let. Store/Lockup size: 340 sq ft (31.5 SqM) approx. PPH Chartered Surveyors & Commercial Property Consultants are the agents appointed to handle the warehouse lettings and are available to answer any enquiries. Please visit www.pph-commercial.co.uk for full details of the industrial units/warehouses available. Walk-in viewings are also very welcome and encouraged, if you would like to 'pop in' and have a look around at any time please feel free to do so. If you would like a viewing out of business hours please ring Ian on 07795 977533 and he will be happy to arrange it. Please feel free to contact us at any time with your questions. From February 2014, MC Engineering Solutions Ltd, will utilise Davian Business Centre's workshop facilities. MC Engineering Solutions Ltd is a dynamic new enterprise specialising in stainless steel fabrication for the food industry. Please contact Mark on 07894 337673 or Dave on 07939 257434 email mark@engineeringsolutions.co.uk, dave@engineeringsolutions.co.uk for more information on their company. We now have several warehouse/industrial units and one office available to let. 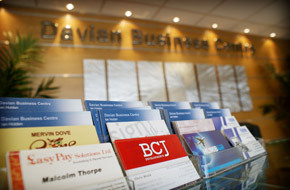 From December 2012, GAC Shipping (UK) Ltd, will utilise Davian Business Centre's office facilities. GAC is one of the world's largest ship agencies, with a long standing reputation for quality service. Please see their website at www.gac.com/uk or email uk@gac.com for more information on their company. Dedicated Transport Solutions Ltd choose Davian Shipping Services Ltd to perform their Transshipping. From the 1st March 2012, Dedicated Transport Solutions Ltd of Cramlington, will utilise Davian Shipping Services Ltd's transshipping facilities. Please see their website at www.dts.gb.com or email enquiries@dts.gb.com for more information on their company.